wage-earners in the industry 65,964. Over 3,000,000 cords of wood were used, and 588,543 tons of paper and 24,952 of rags. Next in order is England, then come France, Germany, Austria and Italy. See works on Paper and Paper Making by Hoffman, Mun-sell, Archer and Dunbar. died at Leipsic, Nov. 17, 1632, pleased that Gus-tavus Adolphus had died just before him. variety of forms. Sometimes it is a tuft of delicate hairs, as in the thistle and dandelion; sometimes two or more tooth-like and often barbed processes, as in tick-seed, beggar's ticks and Spanish needles; sometimes beautifully plumose bristles, as in the blazing star ; sometimes simply a cup or crown ; and sometimes wanting altogether. 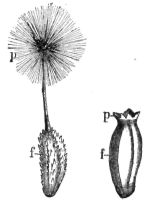 In general, the pappus is developed to aid in the transportation of the akènes by wind or animals. Papua (päp'00-a). See New Guinea. Papy'rus, a species of the genus Cyperus, which belongs to the sedge family, and contains over 600 species distributed throughout the temperate and tropical regions. The papyrus is C. papyrus, and is native to Egypt and Palestine. It is of interest in connection with its ancient use by the Egyptians. "The pith-like tissues of the larger flowering stems, cut into thin strips, united by narrowly overlapping margins, and then crossed, under pressure, by a similar arrangement of strips at right angles, constituted the papyrus of antiquity." It is commonly cultivated in aquaria or in damp soil. The stem is tall and stout, from four to eight feet in height, and bearing at the summit a rosette of drooping leaves. It scarcely occurs in Egypt now, but grows at Syracuse, Sicily. See Paper. Pará (pā-rä'), a city of Brazil, is 70 miles from the mouth of the river Pará. It has a fine harbor, sheltered by wooded islands, which admits large vessels. It is closely built, with narrow streets, well-shaded by mangoes and palms. It has street-cars and telephones, and among its public buildings are a theater, custom house and cathedral. Here are the headquarters of the Amazonian Steamboat Company, which has most of the Amazon River trade, supplying the interior towns with foreign goods and exporting india-rubber, cacao and Brazil nuts. The rubber exported from Pará in 1898 amounted to 22,218 tons. Pará also is a state or district with an area of 443,903 square miles and a population of 445,356. Consult Around South America by Vincent. See Amazon and Brazil. Two forms o£ pappus (p) borne at the summit of akènes (f).